Seven people have been killed after a helicopter crashed on the outskirts of Istanbul, reportedly after hitting a television tower in fog. The Sikorsky helicopter owned by a Turkish company was carrying four Russian guests, a Turkish executive and two pilots. It crashed on a highway in Buyukcekmece district after taking off from Ataturk Airport, governor Vasip Sahin said. The cause of the crash was under investigation, he said. Taxi driver Fikret Karatekin told a TV station that the helicopter hit a former television tower, that now has a restaurant at the top, before crashing. But Turkish authorities have not ruled out a technical fault, Reuters reported. 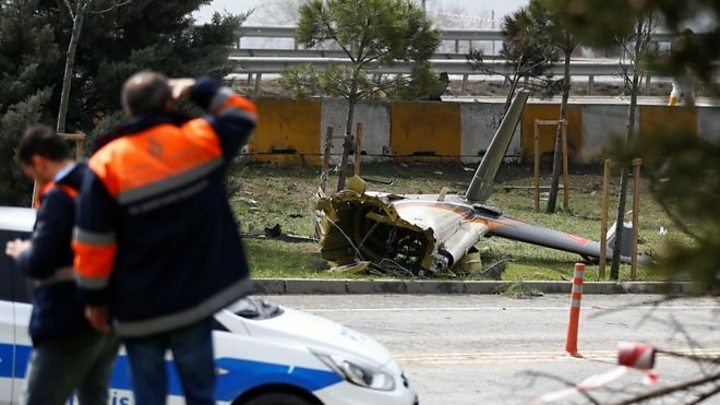 The helicopter belonged to the Eczacibasi group of companies, one of Turkey's biggest conglomerates, with businesses in pharmaceuticals and building products. Chairman Bulent Eczacibasi said the Russians on board the helicopter were clients visiting a ceramics produce fair and were being transported to the company's factory south of Istanbul. The Turkish national on board ran the company's operations in Russia, he said. Russia's foreign ministry confirmed that four Russians were among the dead.